Scott Snyder and Jock are almost unmatched when it comes to creating terrifying horror comics. The pair enjoy rolling around in the blood, guts and gore of the genre while also strumming our last psychological nerve. 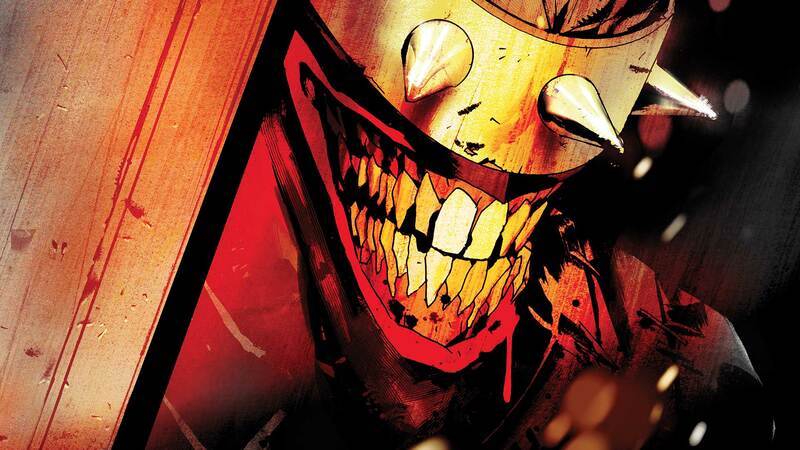 Though this is something they've probably explored most in their creator-owned work, the pair have returned to their horror roots with THE BATMAN WHO LAUGHS, a miniseries that the creative team says is a spiritual successor to their previous exploration of Bruce's psyche, BATMAN: THE BLACK MIRROR. Alongside colorist David Baron and letterer Sal Cipriano, the team delivers on all fronts as they introduce us to a broken man still reeling from the events of DARK NIGHTS: METAL, unable to trust himself or the apparently (relatively) calm status quo in his beloved city. Bruce Wayne has long been an enigmatic figure, one who's sparked many conversations about what kind of man it takes to put on the cowl and take the fight for justice to the streets. THE BATMAN WHO LAUGHS #1 delves into the mind of a man who's sacrificed his life for the city that he loves. Bruce has essentially lost the chance at a normal existence due to the trauma that he's suffered, forcing him to face the decisions that he's made and the impact that they've had. One of the most interesting and original things about the story here is that instead of going the well-trodden route of killing someone that Bruce loves to force this sort of self-evaluation, the book decides to kill multiple versions of the billionaire and use them to show him the lives he could have lived. It's a splendid subversion of the tropes that we expect to further a character's emotional arc, and of course at its most instinctual base level, it's a completely haunting idea: being faced with your own dead body. It's this melding of horror and psychological tension that elevates The Batman Who Laughs into something that really gets under your skin right from the start. Bruce realizes that there's something rotten in Denmark (or should we say Gotham) when he comes across his own corpse, but it's the small differences that really begin to eat at him. This Bruce Wayne lived a happier life than him. He was married, parented a child with Selina and even took up gardening. It's a psychological attack on every level, and it's one that Bruce isn't prepared for. The Batman Who Laughs also plays on another of the biggest questions surrounding Batman: is running around Gotham and beating up the disenfranchised really the best way to spend his time? Snyder and Jock come at it from a different angle, rather than asking the same question that many of us have over and over again. Instead they present us with another alt-universe version of Bruce, but this one is very much alive. Referred to as “The Grim Knight,” this frightening vision of a Batman gone wrong makes his first appearance in Arkham Asylum, mowing down everyone he sees and methodically taking out each person who crosses his path. Grim represents Bruce's greatest fear—what he could become if he kills. In his universe, The Grim Knight killed Joe Chill moments after the criminal murdered his parents, and that singular moment of violence created a gun-toting monster. The Grim Knight's appearance is another test for Bruce, just one more shiny surface in the warped house of mirrors that is suddenly surrounding him. The universe in which the Batman Who Laughs was created is a realm of pure fear, and this first issue establishes that, though he may not yet have a clear goal, the titular villain is committed to bringing everything that has ever scared Bruce into existence. So, of course that means that he has to go after the one thing that the reclusive billionaire needs more than gadgets or money to be Batman—his primary nemesis, the Joker. In the end, though, it's not only that Bruce has to face losing the man who drives him and reflects his deepest and darkest nature, but that he has to truly journey into the heart of darkness by becoming the thing that he's always hated. The symbiotic relationship between the Clown Prince of Crime and the Caped Crusader has always been one of the most interesting and toxic in the DC canon, but that takes on a whole new meaning as the Joker makes a deadly sacrifice to save his enemy and the city in which they've hunted one another for decades. Scott Snyder has said that he wants The Batman Who Laughs to stand alone alongside his best work while building on the wider world he has created during his tenure at DC, and this first issue is a great start. Join me each month as we unpack the latest issue and discover how much darker things will get before we see whatever it is that passes for light in Gotham. THE BATMAN WHO LAUGHS #1 by Scott Snyder, Jock and David Baron is now available in print and as a digital download.